Handel's Arminio has had something of a bad press. Dent referred to its 'deplorable feebleness... The music is for the most art quite unworthy of Handel, and it can only be passed over in silence'. But now that all of Handel's operas have made it to disc in one form or another, we are able to appreciate more the overlooked and unloved as artists rediscover and re-record. 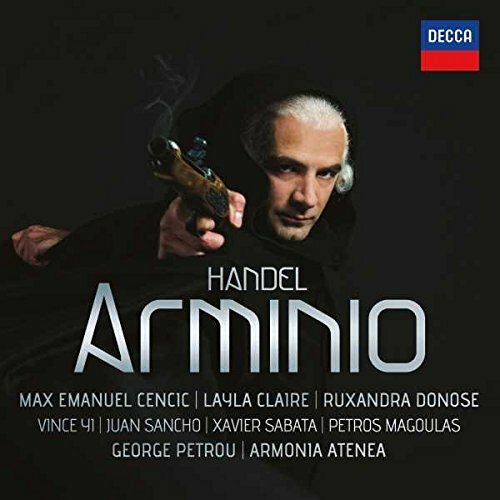 This new disc from Max Emanuel Cencic on Decca showcases Handel's Arminio. Cencic leads a strong cast with Layla Claire, Ruxandra Donose, Vince Yi, Juan Sancho, Xavier Sabata, and Petros Magoulas with George Petrou conducting Armonia Atenea. Arminio was first performed in 1737 during a season when, unusually, Handel presented three new operas (Arminio, Giustino and Berenice) in a season which included eight operas in all and four oratorios. The season failed and not surprisingly, given four years or so of difficult seasons with rivalry with the Opera of the Nobility, Handel's health failed with a 'paralytick disorder' in April 1737. But Arminio was never revived, despite esteem from Handel's supporters. Mary Pendarves wrote 'I think it as fine a one as any Handel has made'. The libretto originates in one written by Antonio Salvi (source of Ariodante and Rodelinda) for Alessandro Scarlatti in 1703. The story, with its noble warring family and complex familial relationships reminds you of operas like Radamisto from Handel's Royal Academy period when the tortuous complexity of the plot was a showcase for scenes of patriotism, love, jealousy, revenge, rivalry and dynastic conflict with the put upon hero able to show nobility and moral rectitude. But by 1737 Handel seems to have lost faith with his audience (and they with him, judging by the poor houses he was getting). He would only write four more Italian operas after 1737. The original libretto for Arminio written for Alessandro Scarlatti has 1300 lines of recitative, but Handel renders it down to just 300, making the plot telegraphic at best. Set against this the presence of seven characters, all of whom get arias, the whole lasts just 150 minutes. Winton Dean describes it thus 'The libretto, as Handel set it, might almost be a send up of the heroic opera seria convention. The action proceeds in a series of ill-motivated jerks, with particularly ludicrous results in Act Three. The situations are not so different from those in earlier operas, but the transitions are awkward or non existent; even more than usual, the characters speak daggers but use none. Their threats and grandiose gestures repeat themselves and lead nowhere'. The cast on this disc is very strong, and all the male characters are played by men. The original had two star castratos, Domenico Annibali as Arminio (the Cencic role) and Gioacchino Conti as Sigismondo (the Yi role). This latter was a soprano castrato with a top C, so it is rare to hear the role sung by a counter-tenor. One fascinating thing about the opera is Handel's use of the duet. He opens with one for Arminio and his wife Tusnelda (Cencic and Claire), and concludes with one for them. En route, there is one for Tusnelda and her sister-in-law Ramise (Claire and Donose). Arminio (Cencic) is a German prince fighting the Romans but betrayed by his father-in-law Segeste (Magoulas) who wishes to accept the Pax Romana. Arminio's first aria is relatively conventional with Cencic displaying a shapely vocal line against strongly characterised accompaniment. But Arminio's trials seem to have inspired Handel and Arminio's Act Two prison aria is powerful indeed, whilst his farewell to his wife is strong stuff and has hints of 'He was despised' from Messiah. Facing execution Arminio gets a typical Handel trademark, a strong accompaganto. The role certainly brings out the best in Cencic who makes the most of these opportunities. Vince Yi sings Sigismondo, Arminio's wife Tusnelda's brother, whose love for Ramise (Arminio's sister) is disturbed by their differing reactions to Arminio's arrest and planned execution. Yi's opening aria reveals a lyric, quite slim-line, narrow-toned counter tenor, in a striking aria with a strong accompaniment. He closes Act One with an aria which alternates plangent lyricism with more vigorous passagework as Sigismondo oscillates between death or life without his beloved. His Act Two aria Quella fiamma features a superb oboe solo with the two duetting and exuberant passagework. Sigismondo gets five arias and by the end, though I was admiring of Vince Yi's command of the passagework and the high tessitura, I did rather find his tone a little unvarying and lacking in light and shade. Tusnelda, sung by Layla Claire, was a role written for Anna Strada del Po (for whom Handel wrote the title role in Alcina). The virtuous Tusnelda is not quite such a vintage role, she is much ill-used and five of her seven arias are in minor keys and there are certainly moments of interest. The opening duet with Arminio is a joyful toe-tapping number, whilst her first aria in Act One is a showy number with lots of vivid attack, depicting love and duty warring in her heart. She closes Act Two with a lovely aria, an emotional appeal to her captor Varo, in which Claire is expressive with a hint of fragility too. Claire has a fine-grained tone and sings with a lovely even top to the voice. In Act Three, Tusnelda contemplates suicide when she thinks Arminio is dead, a touching slow number with an expressive cello solo. This scene culminates in the duet for Tusnelda and Ramise (Claire and Donose) where the mainly homophonic voice writing is surrounded by wonderful, busy violins. The Roman Tribune Tullio is a relatively small role sung by the contralto Maria Caterina Negri. Xavier Sabata provides vivid characterisation with some vigorous singing in his opening aria. The villain of the piece, Segeste, is sung by Petros Magoulis. He proves to be no blustering villain and his Act One aria has some interesting irregularities in the vocal line. Ramise is given interesting depth by Ruxandra Donose, blending with Claire in their duet and shining in her fast and furious opening number. Tenor Juan Sancho sings Varo, the Roman general and a role written for the young John Beard. Sancho has a bright, slim and rather eager voice, his Act One aria is nicely lively though he makes somewhat heavy weather of the passagework and his tone is a little too uniform. His Act Three aria is a wonderfully vigorous number with a pair of horns added to the accompaniment, they and Sancho create really swaggering effect. George Petros and Armonia Atenea give a polished performance with an engaging account of the overture and some lovely solo instrumental playing is the arias. The opera was recorded by Alan Curtis and Il Complesso Barocco in 2001 and re-issued on the Virgin Veritas boxed set in 2009 (see my review on MusicWeb-International.com). Curtis uses women for the castrato roles, mezzo-soprano Vivica Genaux as Arminio and soprano Dominique Labelle as Sigismondo. Neither recording is perfect and it you have one then the other is not essential, but your attitude to counter-tenors singing in alt might affect your decision. I am not certain how well this rather telegraphic opera would go down on stage, but it seems ideal on disc. This new recording is strongly cast and appealingly sung so that you really do listen to some of the arias with new ears.